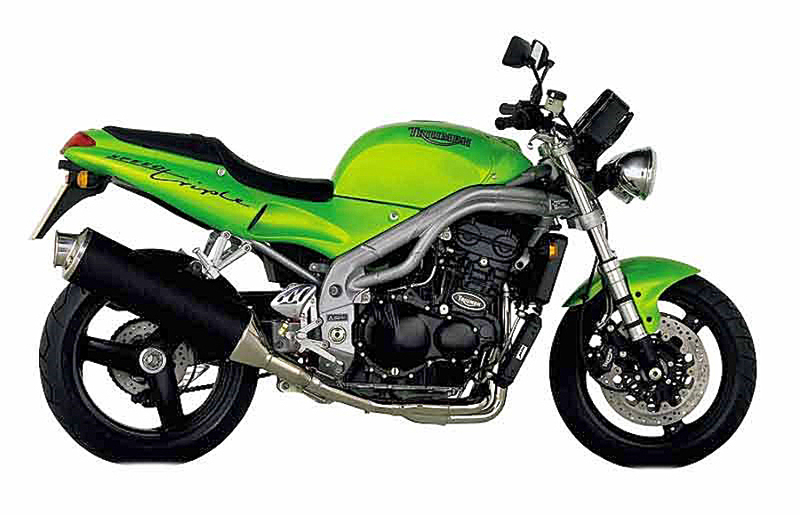 Given the Triumph Street Triple 675’s resemblance to the factory’s big-bore Speed Triple streetfighter, it was given the tag of ‘Junior Hooligan’ at its 2007 release. But while the Street Triple was certainly up for a bit of hooligan action, its sporty all-round performance, rider-friendliness and versatility won it approval from a far wider audience. It was a mainstream marketplace winner, and soon became Triumph’s best seller. It’s no real surprise that the Street Triple is a top performer given the amount of DNA it shares with Triumph’s hot middleweight sportsbike, the Daytona 675. 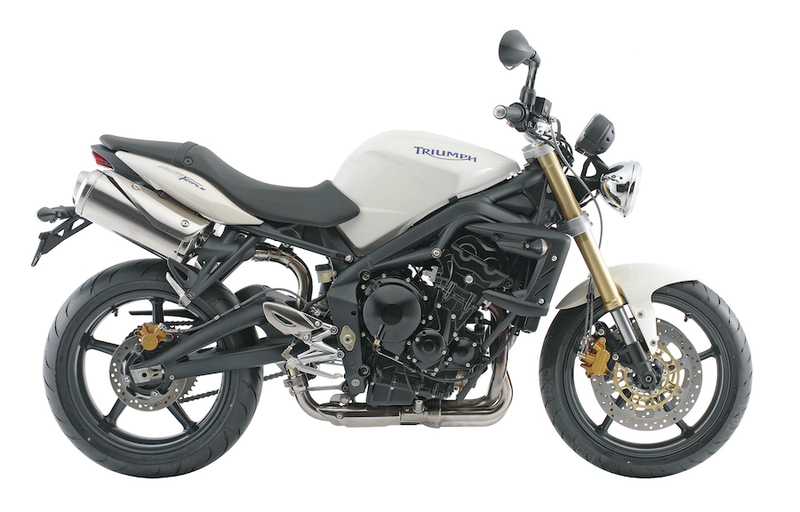 From the start Street Triples have been essentially naked variants of the fully faired Daytonas. While the Street Triple’s version of the fuel-injected 675cc three-cylinder engine trades off a serve of top-end performance for a strengthened midrange, the bike’s chassis shares much with the sportsbike, enabling it to handle and brake very impressively. Its ready acceptance prompted Triumph to add an up-spec version in 2009, the Street Triple R, that enhanced the handling further with the addition of fully adjustable suspension and uprated brakes. The result was a light and speedy all-rounder that keeps pukka sportsbikes honest on a spirited run through the hills, or even at trackdays. While this review focuses in particular on experience with the 2013-model Street Triple R, much of the information is equally applicable to all of the 675cc Rs, as well as providing general guidance about base-model Street Triples. The Street Triple R is very rider-friendly. The 820mm-high seat is comfortable (pillion accommodation less so) and combines with flattish handlebars to provide an ergonomic set-up that’s fine for most rider sizes. You sit in an almost upright ‘action-man’ posture that gives great authority over the motorcycle and a good view of what’s happening around you. Fuelling is spot-on, with snappy but progressive throttle response. Peak power of 78kW drives a light (183kg dry) package, so it’s a lively performer – nail it and it flies, while sounding amazing. It’s a remarkably flexible engine with 90 per cent of max torque from around 4000rpm, so it loves short-shifting if you ever tire of changing gears, which you don’t given the easy clutch action and sweet-shifting six-speeder. 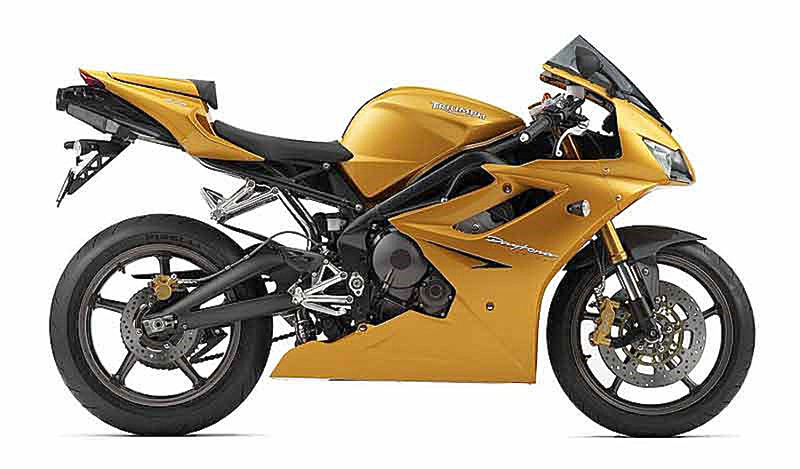 A taller first gear (from the Daytona sportsbike) for 2013 models onward is fine, making the bike a little less flighty in first and a little less wheelie-prone than the previous model – though lofting the front is still there for the asking. A safe touring range of 250km-plus is available from the 17.4-litre tank. It’s a very agile and flickable bike that loves a corner, without trading off high-speed stability. The ride is firm while retaining sufficient suppleness to deal with mid-corner bumps. Braking is excellent, with plenty of power and great feel. ABS, which had previously been optional, began to be fitted across the board in 2013, raising the bike’s price by $500. 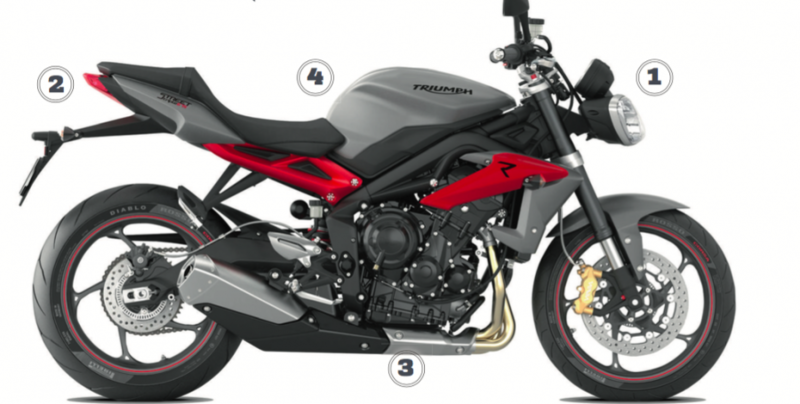 The Street Triple range is extensive, including a destroked 660cc LAMS version added in 2014, along with a sportier RX model that includes a Daytona-type seat, bellypan and quickshifter on its feature list. Late 2016 saw the last of the Street Triple 675s produced, superseded this year by a thoroughly revamped 765cc version. The Street Triple 675 R is an impressive and sophisticated motorcycle, well engineered, well built and with the backing of strong parts availability from an extensive dealer network. It’s an accomplished commuter and a fine bike for weekend sport with your mates. In the many roles it excels at, Triumph’s Street Triple R flatters your skills and delivers riding pleasure by the truckload. 4 Analysis of the Street Triple’s sales history reveals it attracted more female buyers than other motorcycle models. With power from an 885cc fuel-injected triple-cylinder engine and distinctive ‘bug-eye’ headlights, the naked Speed Triple is Triumph’s big-bore streetfighter. Triumph launches an all-new middleweight sportsbike with a cutting-edge chassis powered by a potent three-cylinder 675cc engine. The Daytona 675’s design spawns a new naked ‘bug eye’ middleweight, paving the way for an R version with uprated handling. The Street Triple 675 R is a well-engineered and basically trouble-free motorcycle. More important than a particular bike’s age or kilometres is finding one with a good service record, and cosmetics that have been cared for. Look for worn steering-head bearings and regulator or alternator issues. Always remember to factor in the cost of consumables like chain, sprockets, brake pads and brake rotors that may soon need replacing. Most owners leave work on the Street Triple’s high-tech engine-management system to the professionals. But routine checks, chain maintenance and oil and filter changes allow keen DIY owners the chance of some hands-on involvement. For major services go to workshops with access to the latest Triumph engine-mapping downloads. Minor services including oil and filter changes are required every 10,000km and majors, including valve clearances and throttle-body synchro-setting, are due every 20,000km.